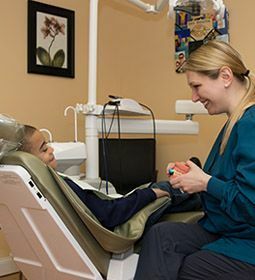 Amerodental, a dentist office located in Newington, CT, has provided personalized dental care to thousands of families. Our patients come from near and far to experience the warm, individualized care we provide. We pride ourselves in utilizing the most modern equipment and methods available. Missing teeth? A bridge might just be the solution for you! A bridge is one or more artificial teeth that are cemented into place using the real teeth on either side for support–hence the name. Bridges are a great option for filling the space created by a missing tooth because it replaces the missing tooth both functionally and cosmetically. Bridge materials include gold alloys, porcelain bonded to metal alloy, or all-ceramic material made to match your natural tooth color. The choice of material depends on requirements for strength, wear, and/or esthetics. 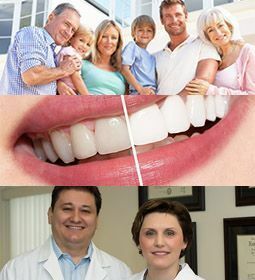 If you have questions about bridges, Dr. Dentist can help answer them, always keeping your best interests in mind. If you’ve thought about straightening your teeth, but are sure if braces are for you, we have an alternate solution! To begin your Invisalign treatment, Dr. Vatafu will take molds of your teeth to design a your trays. Patients switch trays every two weeks to gradually shift the teeth. The system requires a visit to the office every six weeks so that treatment can be monitored. Once treatment is complete, you will likely be given a retainer to maintain the smile. Lumineers® BY CERINATE® are porcelain veneers that offer the painless way to a permanently whiter and perfectly aligned smile. These contact lens-thin “smile shapers” can be applied to teeth without any grinding or shaving, transforming teeth into a naturally beautiful smile that looks perfect for every individual. Lumineers® can even be placed over existing crown or bridgework without having to replace them. Click here to learn about Lumineers®. If you are active in athletics or experiencing any concerning experiences with your mouth, teeth, or jaw, please let Dr. Gabriela or Dr. Lucian know. If any kind of guard or appliance is a good option for you, we will take an impression of your teeth to create a custom-fit product for your specific needs. Custom-designed mouth guards and night guards are made of flexible plastic and molded to fit the shape of your teeth. Mouth guards are recommended to protect the jaw, tongue, cheek lining and teeth during physical activity and sports such as boxing, football, basketball, or other activities where your mouth might get hit. Night guards are recommended for patients who clench or grind their teeth at night to protect their teeth. Guards generally last 3-10 years. Custom-made oral appliances can also be used as part of treatment for conditions like sleep apnea and TMJ disorders. In general, plastic appliances can be used to correct a variety of problems. Get your custom fit mouth or night guard from us here at Addison Village Dental today!